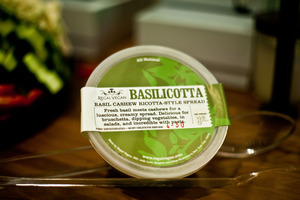 Basilicotta Launches in 12 stores Citywide! The word on the street is out: Basilicotta is a delicious treat and versatile to eat. What could be better than a lush vegan cheese made from nutritious cashews and aromatic Basil. With the feel of a creamy pesto mixed with goat cheese/ricotta but none of the dairy, Basilicotta delights those seeking rich vegan spreads, decadent dips, or those missing that essential ingredient in eggplant rollatini, pasta, veggie lasagna and as a topping for salads. Drop cold teaspoons of it in some bread crumbs and fry in olive oil for a treat you will tell your friends about. Stay tuned for more recipes using this creamy sensation. MANHATTAN East Side Health, Commodities, Health & Harmony and Health Nuts on 64th st (2 ave). Looking for some easy vegan recipes? We’ve added a delicious recipe using Basilicotta to the list!